UPDATE 2/3/16: Pre-sale tickets for the Madison Square Garden event will be available today at 10am (EST) for American Express customers, while ticket sales for the general public will go live tomorrow at 10am. 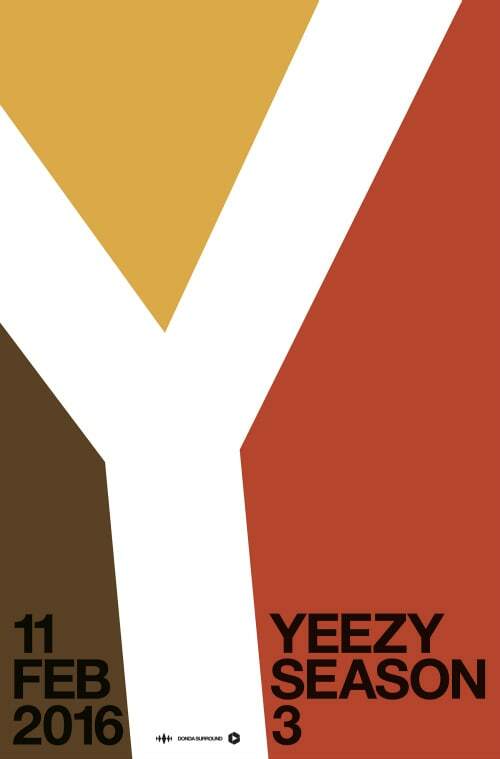 Every ticket purchase comes with a digital download of Kanye&apos;s new album. Click here for more info. One thing to note is that the album title is not listed as WAVES, merely just "Album." UPDATE 2/1/16: Kanye just confirmed on Twitter that the show at Madison Square Garden will be a debut of his album, WAVES. Tickets are also now on sale for screenings of the show around the world, which you can get through Kanye&apos;s site here. As of now, tickets still aren&apos;t on sale for the actual event at MSG. The page notes that additional dates could be added leading up to the show. UPDATE 1/27/16: Pre-sale for Kanye&apos;s event has hit a snag. It was originally supposed to be available today through American Express, but the company has revealed that pre-sale has now been postponed till tomorrow due to "creative differences" with the production company, as our Senior Editor of Content Strategy, James Harris, points out. A rep for Amex also pointed out that the pre-sale tomorrow is not 100 percent confirmed until "creative production" issues are sorted out. A rep for Amex also told Harris that the only way to keep up with it at this moment is to check on Kanye&apos;s website, which hasn&apos;t been updated as of now. What&apos;s more, the event is being billed as a fashion show, though it&apos;s still unconfirmed if Kanye will perform as well at MSG. It&apos;s also unclear what the size of the event will be. We&apos;ll update when more information becomes available. See below for the original story published on 1/26/15. 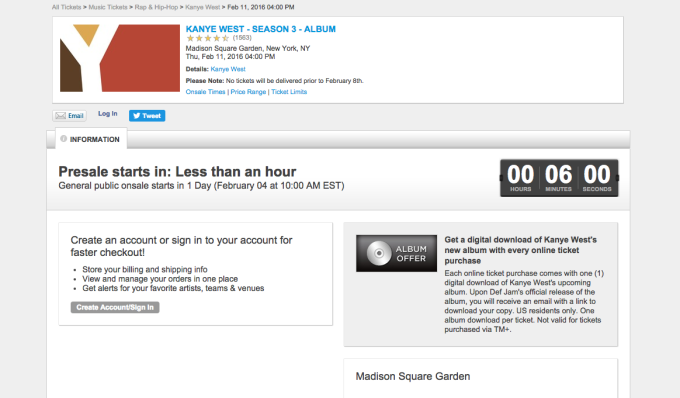 UPDATE: Tickets for the Yeezy Season 3 show at Madison Square Garden are now officially listed on Ticketmaster, and are set to go on pre-sale tomorrow, and then everywhere on Friday. Full details on tickets available to the show here. Kanye West&apos;s SWISH album is dropping in a few weeks and rumors are running rampant about the project&apos;s release. There are now reports that &apos;Ye may be planning to premiere the album in full during a Yeezy Season 3 show at Madison Square Garden during New York Fashion Week. 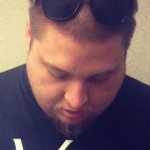 Nothing has been confirmed by his camp just yet, but as Reddit found, tickets are currently being sold over in Europe for the live-stream of the event. The site that they&apos;re directing people to buy tickets from—Tickets.KanyeWest.com—appears to be live, but is blank at the moment. It could potentially take place in theaters around the world similar to what Ye had planned for his Yeezy Season 2 event. He already announced that the album will be released on Feb. 11, but hasn&apos;t shared any further details on its release. Rumors about Yeezy Season 3 began after Kanye shared a photo on Twitter last week of a logo for the line on a laptop. There was also a tweet from Kim Kardashian​, where she explained that &apos;Ye was recently in Italy for a Yeezy Season 3 fitting. He&apos;s already said that he&apos;s finished the"best album of all-time," so things are about to get very interesting. We&apos;ve reached out to Kanye&apos;s rep for comment and will continue to update this as more details come out.